I am pleased to report that my gallant Trek Domane has been in for a service. I am less pleased to report that I have been guilty of a little bike neglect. But there is a silver lining to every cloud. In this case it’s an Ultegra lining. And this nimbostratus may even have a platinum lining as we, whisper it, consider… new wheels. So, without further ado (and another paragraph that starts with a conjunctive), I give you my bike service REPORT! I’ve talked in recent posts about buying a torque wrench (which I still haven’t done yet), with the implication that I would be servicing the bike myself. Essentially I came to the conclusion (correctly), that even armed with a torque wrench, I would still only be able to do part of the job. And even that part would be hampered by my lack of experience. The inciting incident that drove me to book the service came after I gave the Domane a good clean a few weeks ago. Following that spruce up, as I pushed the bike along the drive, the pedals rotated forward of their own volition (well, of the volition of the rear wheel hub). Which is not meant to happen. The concern camel (which I think is a thing) was already loaded up with my worry that the Domane’s bottom bracket hadn’t been disassembled and serviced since I bought the bike nearly 3 years ago. Given that I’ve ridden it through three Derbyshire winters on dirty Derbyshire roads, I’ve been pedalling towards a fused bottom bracket (and a new frame) for some considerable time. Which is a bent front derailleur. Luckily, my earlier rear hub/bottom bracket concerns meant that I was already booked in for a service with Mark at the The Cycle Hub in Ashbourne the following Saturday. Which is yesterday, calendar fans. But not if you’re reading this post on any day other than today. I suppose I could have simply replaced the derailleur with a new 105 version. But what’s the fun in that. 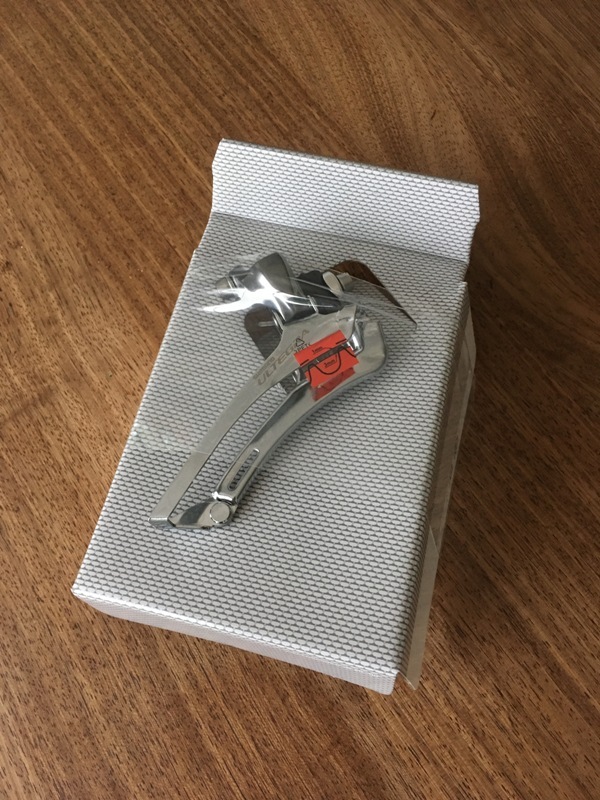 Given the need to get the part quickly (without overpaying for delivery), I ordered it from Evans Cycles and used ‘Click and Collect’ to get it delivered to the store in Birmingham. Which just happens to be a 5 minute walk from my office. The important thing here was to make sure I ordered the 10-speed version (given that I have 10-speed 105), rather than the newer 11-speed Ultegra model (or the Di2 version, which is, clearly, very incompatible). It looked like this. Suddenly Shimano’s naming (or rather numbering) conventions become quite useful. My old derailleur came from the 105 family of components known as 5700. 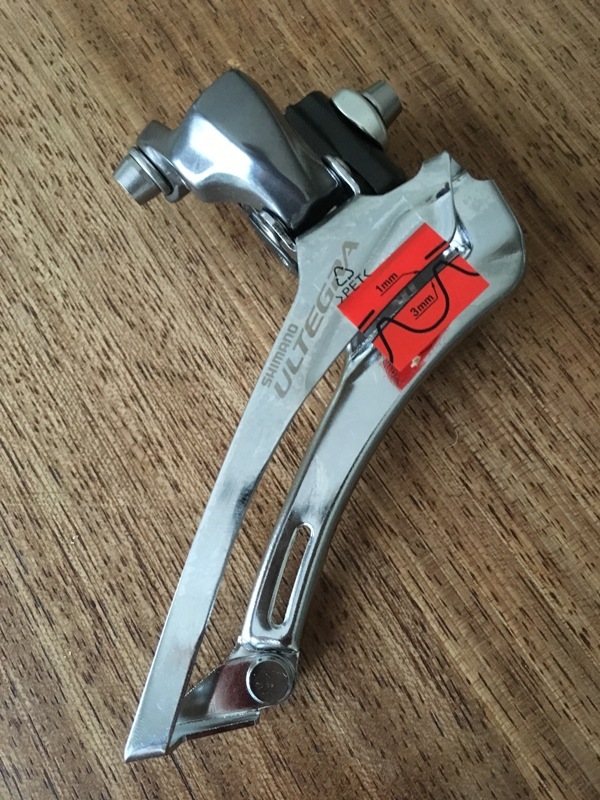 So I needed an Ultegra derailleur from the 6700 family. If you’re upgrading 11-speed Shimano 105 (the 5800 range), you’ll need a 6800 front derailleur. Simples. One last (unnecessary?) 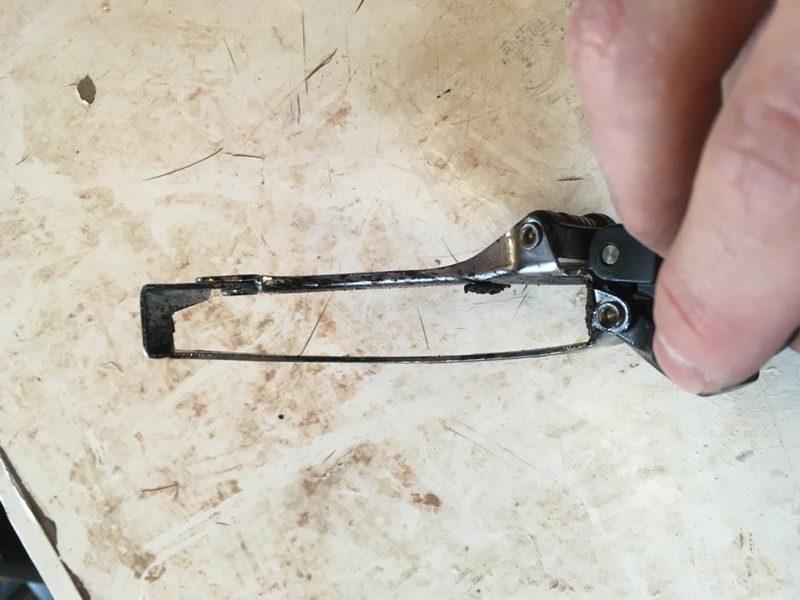 photo of a new derailleur…. … so that I can mention that this is a ‘braze-on’ version (the bolt at the top right of the unit – top middle of this photo – attaches to a specific mount on the bike frame). This is as opposed to it clamping around the seat tube (known as a ‘band-on’). If you’re upgrading along at home, make sure you get the right one for your frame. In the distorted world of road bike ownership, the line between good news and bad news is sometimes blurred. And sometimes entirely reversed in terms of emotional response. Mark’s immediate prognosis of my seized rear hub is terminal. A hub that turns the pedals rather than freewheeling is not a hub that is much more for this world. The wheels on my Trek Domane are the original ones that came with it, a pair of bog-standard Bontragers, which were no doubt specced to keep the bike below a certain price point, rather than for performance. So, do I source a replacement hub, and pay for the labour in order to restore the wheel back to its former ‘glory’, or do I take the nuclear option and buy a new pair of (better) wheels? I’ve been neglecting my bike. The chain is cloyed with gunk. I’ve let chain wear get so bad that it is a full 1% longer than it’s original length (you should replace chains at 0.5%). As a result, my cassette is done for. My chain rings are a bit ‘shark toothy’ (technical term), denoting that they too are a bit on the chucky outy side. And yet. And yet. Perversely I see this as a positive. Now I can add a cassette and chain to the list of Ultegra components on my bike. This will surely add another couple of marginal gains to the marginal gains cupboard. (As an aside, to keep a 10-speed cassette with a 30-tooth largest cog, I think an upgrade to Ultegra is mandatory. The Tiagra one that came with the bike is no longer made). Mark reprimands me in the softest possible terms about my (chain) hygiene problems and advises that he always fits a quick link to new chains. Thus a chain can easily be removed for degreasing (hint: which should be done regularly). We decide to leave the chain rings for now. These will need replacing soon though, immediately prompting the mental machinations that will find me justifying a full upgrade to an Ultegra chain set versus a much cheaper set of replacement chainrings (which are barely even 105). I leave Mark to get on with the service. I have much to think about. I have much to research about. I sit down at the computer with a coffee (premium instant – only the very best for this important work). I start to scribble notes. Shimano. RS31. Mavic (who make the roundest wheels). Fulcrum or (whisper it) Campagnolo. A wealth of blog postery presents itself. Then. Disaster. A series of Twitters from Mark at The Cycle Hub. One, he doesn’t have my number (hence why he is Twottering). Two, I don’t need new wheels. The problem isn’t the free hub. There is some over issue around the cassette lock ring catching. This will be sorted as he takes apart and services the hub. He’ll be able to complete the bike service today. I don’t need new wheels. So let’s take things back to a (Sir) Dave Brailsford level of emotion. Mark completed the service. I watched the penultimate stage of the Criterium du Dauphine on ITV4. I went back to pick up the bike. Mark ran me through everything he’d done. As a testament to his OCD, not only had he tightened every bolt to its optimal torque level, he’d rotated the spacers on my stem so that the FSA logos faced out at exactly 90 degree angles from the bike. And he’d serviced all the important things as well. My bottom bracket was fine (just to get all of you off your tenterhooks). As was the one on the bike (yak yak yak). Given the type of bottom bracket on the Trek Domane (pressed directly into the carbon, with no plastic shell), I will need to keep an eye on the cranks for any ‘play’ in them. And then he dropped the bombshell. I WILL need a new set of wheels. Whilst the hub isn’t knackered, there are signs of distress. There were signs of pitting around the axle cones. The old bearings (which Mark replaced) were worn and dull. It’s not urgent, but I should think about getting a new hub body. Or new wheels. And I don’t need to be told twice! Take that nascent research out of the ‘to shred’ pile. Gird the loins of your bank account. Carbon rim job here I come. Re-ee-search, The Crowd Say Wheel. Selecta. So it’s back to the research board. And I have a bit more time to revel in the selection process, rather than being rushed by the need to get the bike on the road. It’s safe to say there will be future posts about wheel types and my selection, as I delve into this mysterious world. 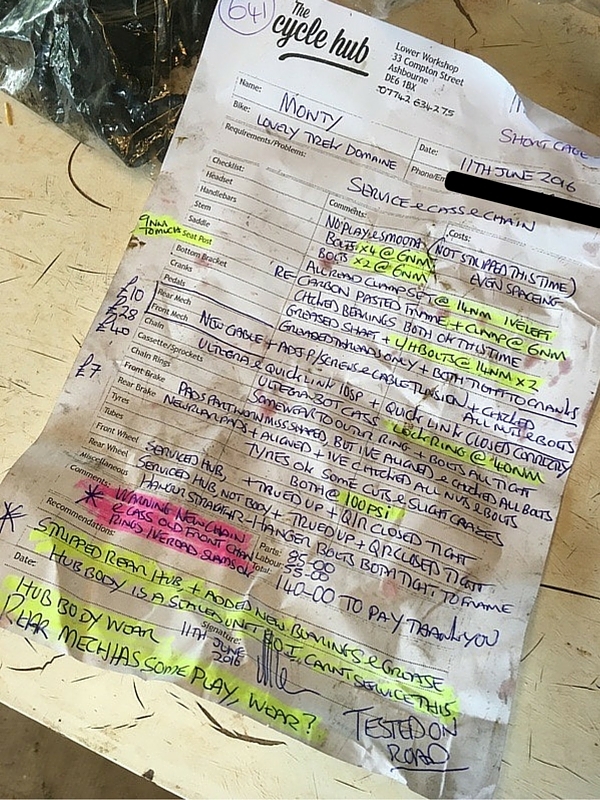 The guff I’ve written above represents just a tiny percentage of the information and advice that Mark provided me with before, during and after the bike service. The work was done to the very highest standard (even to my barely-trained eye). Little things (extra grease in the shifters that will over time work down the cable housing; new higher quality cable) speak to a top notch job overall. And all at an extremely reasonable price. If you live anywhere close to Ashbourne (even within an hour radius), you should get Mark at The Cycle Hub to fix or service your bike. That’s it. The Trek is newly serviced. It’s now a 105/Ultegra hybrid. 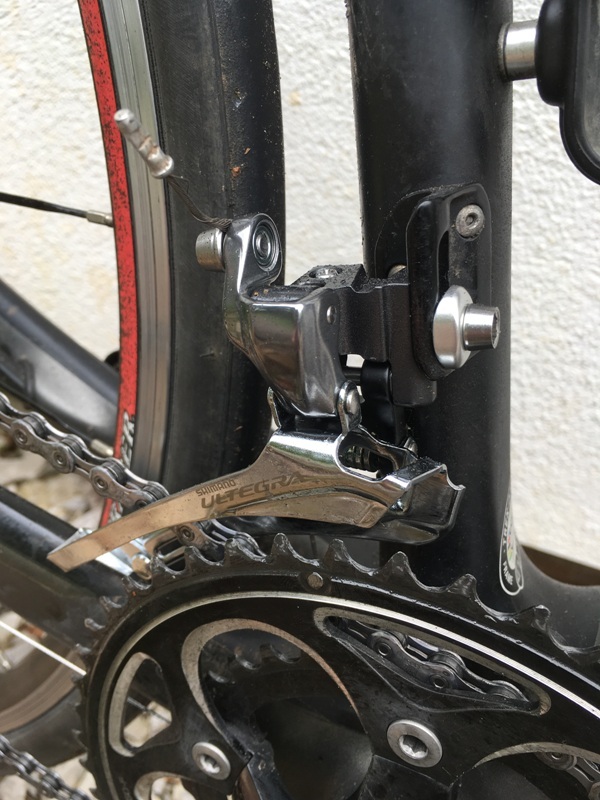 I’m off to buy a chain quick link release tool (plus a spare quick link for the saddle bag – making sure I get the ones for my 10-speed chain). Also, I do solemnly swear to clean my drive train more frequently and diligently than I have in the past. I think we can all learn a little from the lessons in this post. Please to discuss in the comments, ja? 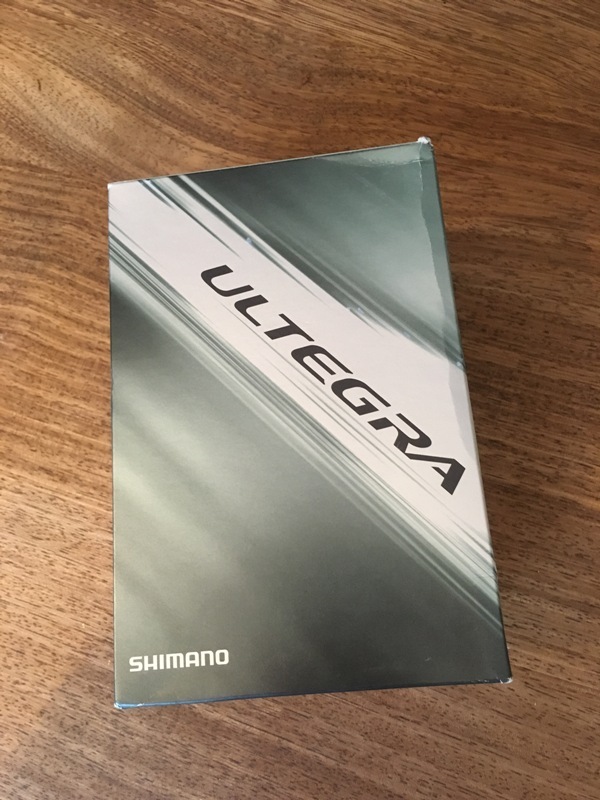 Shimano 105 vs Ultegra: Is It Worth It To Upgrade? I ride a 2010 Kona Dew (I was one of those “prospective sportive cyclists [who] wake up one day, having not ridden a bike in 20+ years” and decided not to spend all my nickels on a shiny, narrow-tired road steed). Late last summer, thanks to some serious blowout sales at Wiggles and Evans, I decided to replace most/all of the major components (Tiagra 4600-series shifters, front derailleur, chain, bottom bracket, 4650 compact crank, and 11-25 cassette; 105 5701 front derailleur; Fulcrum Racing 7 LG CX wheelset). The change in system certainly feels incredibly better than the stock setup; that coupled with the expenditure of funds makes me want to take care of it a little better than the virtually nothing I did for my stock components. To that end, I was gifted some Finish Line 1-Step combo cleaner/lubricant. Thus far (350 miles or so) I’ve used it twice, after riding in heavy Belgian rains, meeting (I think) the criteria for their claim that it’s for “cyclists who take a minimalist approach to drivetrain maintenance.” It seems to work decently well, cleaning a good amount of crud of my chain and keeping things spinning silently. Thanks Dominic. Right now I feel reluctant to take out my newly-serviced bike in the slightly glum weather conditions, for fear of getting it all dirty again… Not the attitude! That’s why we have more than one bike! Regarding training wheels. I just did some research for my colleague who wanted to buy some inexpensive training wheels. The choice was between Mavic Aksium Elite, Fulcrum 5 with some iterations and some Campagnolo like Vento and Scirocco. Common knowledge is that all these wheels are bullet proof. Mavics are supposed to be on the softer side so meaning more comfortable ride while Fulcrum/Campagnolo have better hubs and are stiffer. My choice right now would probably be cyclocross version with duble sealed hub Fulcrum Racing 5 LG CX. LG means wider rim for wider 25 and 28mm tires. Great for winter and rought roads. Only 1645 grams, around 240 Euro. I myself can also recommend Campagnolo Zonda. I did over 25k km on the flats, Alps and some very rough Hungarian, Czech and Slovakian roads. There are still true and never needed any servicing. Thanks Jack. This will form the core of my research. Campagnolo and Fulcrum are the same company with Fulcrum being the Shimano variants of the Campag wheel (they only want Campag wheels with Campag chainsets etc). So you’ll need to be looking at the Fulcrums. I can highly recommend the CX Racing Quattros sealed hubs but equally at home on a road bike as otherwise identical and worth the extra tenner. Or Fulcrum 3’s if you are slightly more flush. I have the exact same bike as you Monty. Looks like we are in a Ultegra race!! My chain and cassette are now Ultegra and before doing a recent Gran Fondo I treated myself to Ultegra Wheels. I’m not sure if they make me any faster but they look lovely!! One upgrade you most do is getting rid of that horrible silver bar tape. I bought some black bar tape and watched some YouTube videos so I could have the pride of applying it myself!! Bike looks so much sexier and therefore must be faster! Hmm interesting. I’ve never even given my bar tape second thought…. Ultegra wheels eh? Will add to the research list. I too have a Domane 4.5 and really pleased with it. Upgraded the wheels last year to a lovely pair made for me by Harry Rowland (www.harryrowland.co.uk) – beautifully made and not dramatically expensive. Harry gives good advice about the weight and type of wheels you need based on type of riding and bodyweight (most people specify wheels that are too light based on Cycle Mags obsession with saving grams). Thanks Kel. In my daydreams I sometimes think I’d like to build wheels for a living. Just sitting in a little workshop with a look of peaceful Zen upon my face…. On my Specialized Roubaix SL2, I use Campagnolo Zonda with Specialized Roubaix Pro 700x28C tires for training and mountains and Fast Forward F6R carbon-alloy wheels with 700x24C Specialied S-Works Turbo tires for group rides. You can get Campagnolo wheels with Shimano freehub body without any problems. Jack – apols – I stand corrected…. 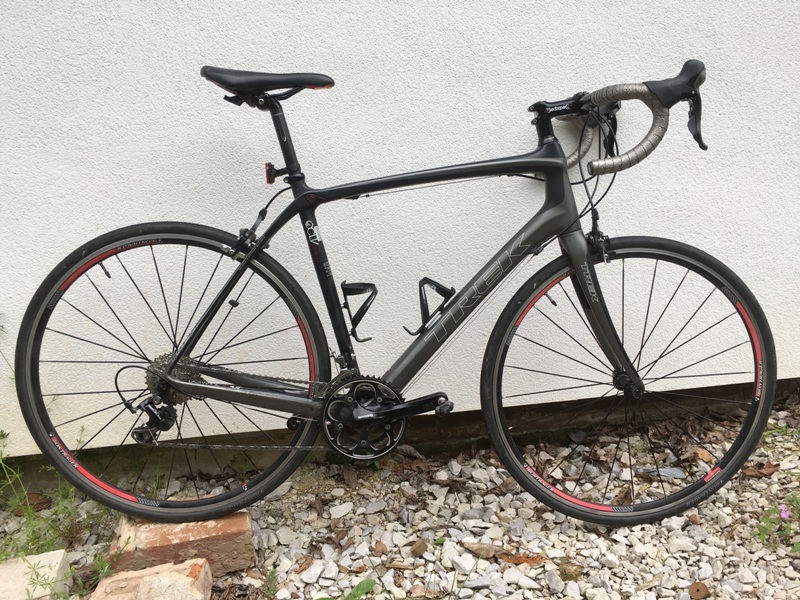 I upgraded my wheelset last year for my 2013 Giant Defy 2 as i cant justify buying a new bike – marginal gains not really needed. Following a good review from Cycling Plus and a bit of email enquiring, purchased a set from Superstar Components. New wheel set weighs about 1.5 kgs – and cost around £160/set as had 20% off. Free trueing for life too!! Still look pretty good 12 months on, I too am ‘maintenance lite’, I have also bought some of their high quality tools. You should check them out. Enjoy your blog, keep on riding! It would be interesting to know the relevant pros and cons between cleaning a chain on the bike with a chain scrubber as opposed to cleaning it by removing it? Or is it just me……. FWIW I don’t remove mine. If you watch any of the Pro mechanics they clean on the bike. Use something like a Morgan Blue degreaser painted on with a brush, chain spun around which cleans the jockey wheels. Then a wipe with a tight sponge as well as the chain is spun. I remove the rear wheel and clean the cassette when I clean the bike (and use a small substitute chain guide), but leave on for intermittent cleaning. Once clean I use a dry lube (wiped off after a couple of hours) and then wipe the chain after returning. The best way to keep it sparkling is frequent, easy cleaning rather than an infrequent major exercise IMVHO. I’m sure you’re right about the frequent cleaning, in order to stay on top of things, rather than waiting til a big clean. 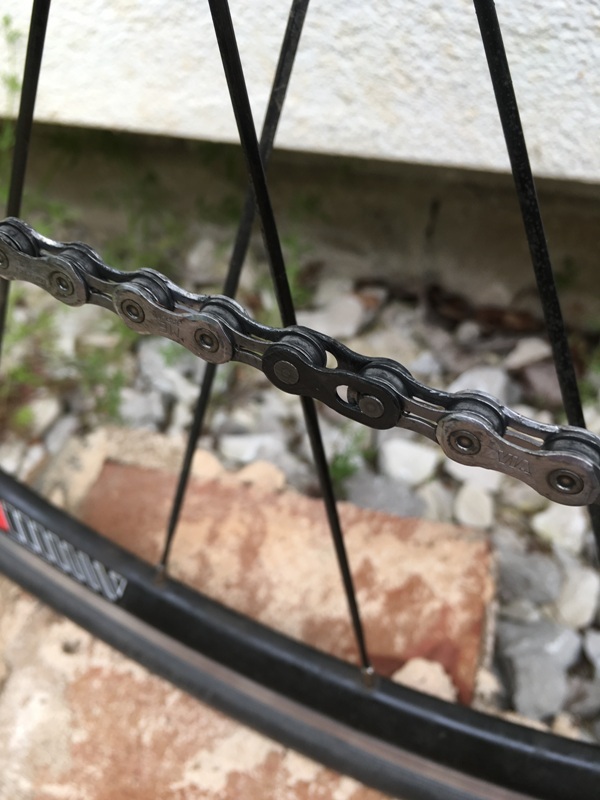 I deep clean my chain every few weeks (the muc-off degreaser does cut through the crud), then use WD40 to drive out the moisture before using Squirt wax lube (which attracts less dirt in the first place). I also clean the cassette every month or so. 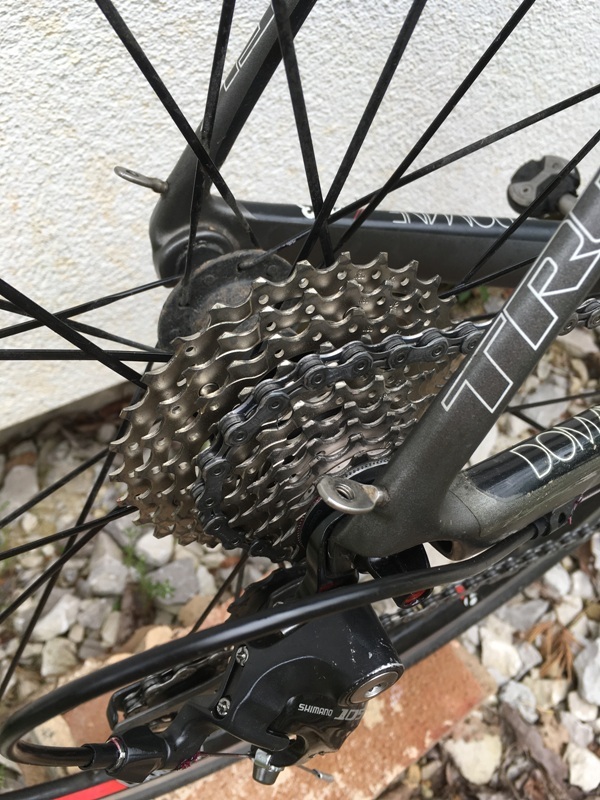 The fastest way to do this (I find) is to remove the cassette from the bike, put a long zip tie through all the cogs and spacers to preserve the order, then use degreaser and a jet wash to clean. Thanks Monty; well done. I own a Litespeed Ti T3 with a carbon fork, Dura-Ace group and Reynolds Assault SLG wheels. It works.